There are a number of kits of the Citroen 2CV - the ‘Ugly Ducking’ - but until now the van version, equally popular in France, was unobtainable as a convention plastic kit. Now Tamiya has modified its 1:24 scale 2CV saloon car to make the Fourgonnette van, with distinctive corrugated sides and roof. Mat Irvine: The kit represents a vehicle that is a French classic. All long-standing car-producing nations seem to have a vehicle associated with that country: the United States has the Ford Model T, Britain the Mini, Germany the VW Beetle, and Italy the Fiat 500. With France it has to be the Citroen 2CV, so here Tamiya has scored a big plus with this choice of kit. But it is a slightly more than just Tamiya, as the Fourgonnette is a co-operation with Ebbro, a company based in Shizuoka, Japan. Ebbro primarily makes diecast vehicles to 1:43 scale, so the introduction of a 1:24 kit may seem slightly odd. However Ebbro's founder and CEO, Makoto Kiya, used to work for Tamiya, hence the connection here. The basic construction of the kit is the same as Tamiya’s saloon version, with new runners included for the van parts. Some original parts are not required, so are darkened out in the instruction leaflet, and are not included in the component count. One stipulation when Citroen first made the 2CV was that it had to be able to, ‘carry a carton of eggs across a ploughed field - without breaking them’ and to this end the 2CV was designed with a very flexible suspension system. Tamiya made this a feature of the original kit, with both front and rear components being held in place with self-tapping screws, so the suspension really does mimic its 24 times bigger frère. The tiny two-cylinder engine (below) is neatly detailed, as are the inboard drum brakes and front driveshafts. The forward wheel arch and bonnet section needs a slight twist to sit properly, but is a straightforward task. The rear van bodywork can be built up separately, and it’s best to paint it without the roof in place, as the interior floor and walls were usually painted in the same shade as the exterior. The rear doors of the model don’t hinge as such, but can be fixed closed or open. The same applies to the doors for the driver and passenger. 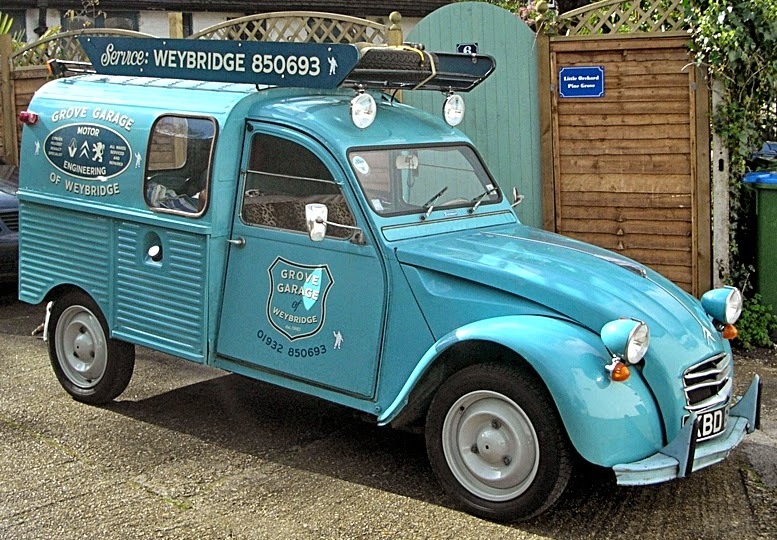 The box shows a light-grey version, a standard Citroen colour, but the decals, and hence recommended colour scheme, are - oddly - not for some French boulangerie, but for the vehicle shown below, owned by Grove Garage of Weybridge, Surrey, UK. 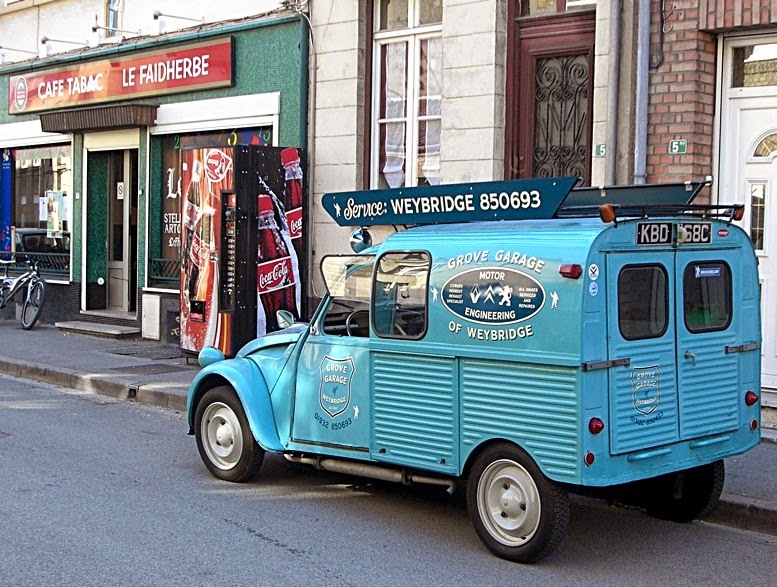 For this archetypal French vehicle it may seem a strange choice, but Grove Garage is a specialist Citroen-Peugeot garage that also supplies vehicles for TV and films, such as the Tim Burton remake of Charlie and the Chocolate Factory. Grove Garage is owned by Alex Abadzis, who kindly supplied these pictures. I’ve been in touch with him to get the full story, which is a slightly convoluted one. Alex had originally imported the van from France and had it signwritten as shown here. But then he sold it on eBay, to someone in Japan, who shipped it over there. It then went to another Japanese owner, who worked for Tamiya, who may have been Makoto Kiya of Ebbro, though this part still isn’t clear. By then the vehicle had acquired the mid-blue and black finish as depicted in the kit. The first Alex knew of it was when someone turned up at the garage and presented him with the kit! Note that although this version is British registered with a UK license plate, a French plate is also supplied and the car stays left-hand drive. The assembled 2CV Fourgonnette (below) which I have shown in a suitable diorama setting, even if the workshop probably doesn’t match the real Grove Garage. Various elements of the diorama are from Fujimi: the overall structure is made from two Garage Set kits, while other bits and pieces come from the Tools and Accessories Set. Thanks for the review kit to the Hobby Company, UK importer and distributor for Tamiya, and to Alex Abadzis for the photos and story.